Among the many issues which Mother Jones championed was the protection of workers and ensuring that miners and factory workers worked in safe and decent working conditions. In spite of the passing of a century, tens of millions of workers are still denied basic human rights. None more so than the modern day slavery which is institutionalised in Qatar. This has been highlighted by the preparations for the World Cup in 2022. It is totally unacceptable that thousands should die to ensure we can enjoy the beautiful game in 2022. David Joyce, the International Development Officer of the Irish Congress of Trade Unions (ICTU) will discuss the position at a lecture entitled “Qatar……a World Cup graveyard?” which will be held at the Firkin Crane in Shandon at 12 noon on Wednesday 30th July next, all welcome! “Recent reports of corruption involved in the awarding of the 2022 World Cup to Qatar have cast doubt over its suitability as a venue for the Football World Cup. Long before these revelations however, trade unions and human rights activists have been calling for a rerun of the vote for other reasons. What’s wrong with working in Qatar? Qatar is a government which takes no responsibility for workers. There are 1.4 million migrant workers in Qatar who have no rights. 4000 workers could die before a ball is kicked in the 2022 World Cup. 1200 workers have died since the World Cup was awarded in 2010, on available data from just two countries. Qatar is a slave state. 1.4 million migrant workers are trapped in a broken system. Fundamental rights and freedoms do not exist for workers in Qatar whether for poor migrant workers or highly paid professional expatriates. Foreign workers are enslaved – owned by employers who hold the power of recruitment, total control over wages and conditions of employment, the authority to issue ID cards and the ability to refuse a change of employment or exit visa to leave the country. This is known as the kafala system. Unions around the world have been calling on FIFA to rerun the vote for the Qatar 2022 World Cup unless Qatar respects workers’ rights. FIFA president Sepp Blatter has finally conceded the decision to award Qatar the World Cup was a mistake. 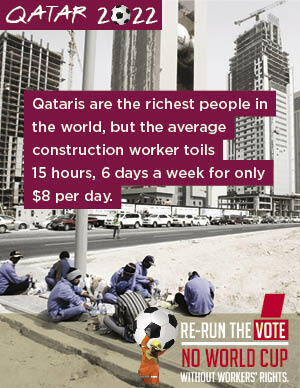 But Qatar’s promises on labour laws have been purely cosmetic and it is time for FIFA to stand up for human rights. FIFA must use this opportunity to be a catalyst for change and ensure that the World Cup only takes place in Qatar if workers’ rights are fully guaranteed.